**Late Ad: REUTERS PHOTOG FOUND DOCTORING PHOTOS FROM WAR. IS FIRED. Michelle Malkin and Blackfive have the goods on the guy. 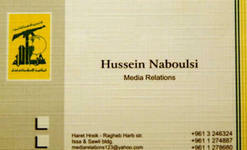 Hezbollah’s PR Flak: See below for Hezbollywood. This Picture is Fine. But at the Park? Nope. At the Mall? Nope. Private is fine. Lovely picture. Like this in public? No, thank you. Ladies: Love ya, mean it, but these Nurse-ins by militant milkers are boorish, self indulgent and annoying. Just because you have just discovered what your breasts are for doesn’t mean the rest of us are uninformed. Having breast fed three children I can tell you my (well fed) chillins never needed to have me open my shirt so everyone could get a peek. Get a blanket. Heck, get a room. I am writing to say how disappointed I was in your recent segment regarding breastfeeding in public. The attitude presented by you and many of your callers is, I believe a part of the reason why breastfeeding rates are so low in North America. I do not live in Portland, but I heard of your nasty diatribe against nursing mothers. I must say that you and all of your callers who slammed nursing mothers are mentally ill. You have sexualized breasts so much that you are ignorant of their main purpose: TO FEED BABIES! I am a nursing mother of a toddler, and I will feed my baby whenever he is hungry, whether or not I’m surrounded by morons such as yourself. That” thing (as you refer to it) those women do (it’s called breastfeeding by the way) – is not gross, nor is it akin to emtying your bowels as you indicated – it is the FEEDING and NOURISHMENT of a child. Something I would think someone that is so into “family values” might agree with. Oh wait, but you do support it, as long as the mother hides in the closet, toilet, telephone both, or wherever, so long as no other person on this earth must view this disdainful, dirty act. Ladies, ladies, I never referred to breastfeeding as “that thing” and I never said it’s dirty, that breasts are for prurient interests only, or that you should be shoved into a broom closet. If you have to mischaracterize my disdain for women who insist on being purposefully exhibitionistic to make a political point then you’ve lost the argument. All we’re asking is that you become tolerant of those of us who really don’t care to see your breasts being brought out in front of the public to feed your baby. A piece of cloth to cover yourself will suffice. See, you respect our sensibilities and you feed your baby! It’s a compromise. Are you willing to do that?